Every Wednesday at 5:30 p.m.(except for Thanksgiving and Christmas week), the Humane Borders family -- including staff members, volunteers, and our board chair -- meets at our headquarters at 243 West 33rd Street in South Tucson. After an opening prayer, and introductions if necessary, we discuss the work done the week before. We celebrate our modest victories, and analyze problems we’ve encountered. We learn of upcoming events of interest, and hear reports of missing migrants being searched for by their families. We examine the state of our relationships and contacts with government officials, including federal land managers and the Border Patrol. There is also the opportunity to sign up for future water runs. If you are thinking of becoming a volunteer, going to one of our meetings is the best way to get acquainted and get started. 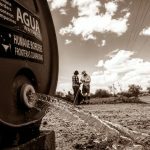 Our water runs are regularly scheduled trips, leaving from Tucson, Phoenix, and Ajo to our water stations in the Sonoran Desert. The runs usually start at 6 A.M., and last for a few hours up to most of the day, depending on the route being serviced. 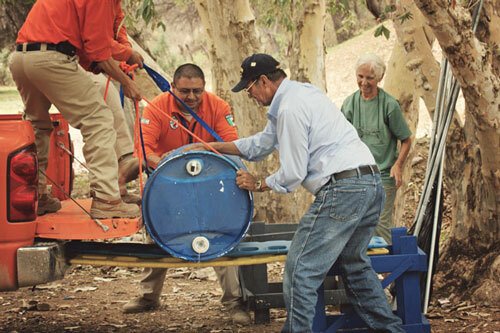 We check our water barrels and fill them when necessary from the 300-gallon tank on each truck. We maintain and replace, when needed, the blue flags that alert migrants to the stations. We test the water for particulates, as required by our permits, view it to ensure that it isn’t polluted by algae, and taste it to make sure it’s readily potable. If we discover vandalism of our stations, we make repairs. We pick up items such as worn-out clothing and shoes and empty water bottles discarded by migrants. Our trucks are air conditioned, and hold four (five in a pinch) volunteers. We suggest that volunteers on water runs wear sturdy footwear such as hiking boots, a hat, and sunglasses. Work gloves are helpful. It’s a good idea for volunteers to bring water for personal use and something to munch on. A good sense of humor is something that will definitely come in handy. Be prepared on water runs to experience the camaraderie felt by Humane Borders volunteers. You will meet new people from wildly varying backgrounds and viewpoints, united in a common desire to help the desperate, often vilified fellow human beings making the perilous desert crossing. We are united in the hope that our efforts will help some migrants avoid an excruciating death by thirst and exposure, and that their paths may be safe ones. One of the benefits of participating in water runs is the opportunity to be out in Arizona’s hauntingly beautiful, ironically deadly desert landscape. You will understand and see first-hand, as you never could just by reading a book, the hardships that migrants encounter on their crossings. For more detail on what it's like to volunteer for a water run, download "What To Expect If You Go on a Water Run"
We welcome visiting religious, school and civic groups by prior arrangement with our Executive Director or Board Chair. Our knowledgeable volunteers and staff can help educate members of such groups on current border issues, and provide them with an experience of the challenges posed by the Sonoran Desert. Some groups in the past have taken on particular projects, such as collecting migrant and other trash from the remote roads that we service. If you have such a project in mind, please feel free to contact us to arrange this.